Hi, I am trying to setup a couple of web pages to access a database which I have uploaded to my web space. I have created a MySQL Database called test. Now, I am using dreamweaver and although I can set up the site to access accuwebs servers when I try to make a database connection I get HTTP Eror Code 400 Bad Request, errors. Is possible to conncet Dreamweaver with sql or access ? 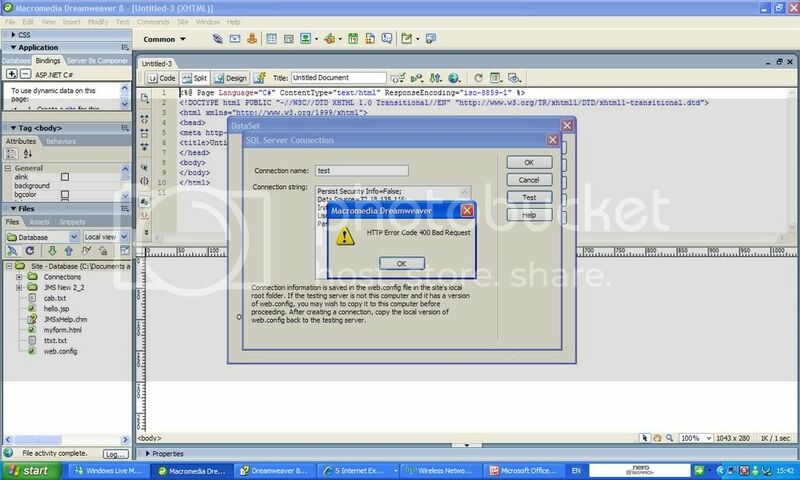 When creating a database link in dreamweaver make sure that the testing server has a host directory of /web or you will get errors as dreamweaver tries to create (and gets denied) files in the wrong folder. You can find out your MySQL details in ISPConfig under ISPManager, <Select your site>, Options TAB and your databases and users will be listed there. If not click the new button and create one. Edit: The testing server should be setup to FTP into your webserver using normal FTP login details. Always use your host name as localhost and then try to access the database using the db name, password, and db user details. USING "MySQL Database" option you can create mysql databsae. After creating mysql database you've to add users to that mysql database. You can do that in the same screen of "MySQL Database". yeah u have to create mysql database to over come on the problem. there are many complaints about the dreamweaver, better not use it.. Yes, MySQL will be easy to use with Dream-viewer. Can you which server you are going to use ? why not just use MYSQL query browser, Dreamweaver is notoriously buggy and cumbersome for these things! When creating a database link in Dreamweaver to ensure that the test server has a host directory / web, or you will get errors that Dreamweaver is trying to create files in the wrong folder.